The basic logic can be described simply. If there are some people with many friendship ties and others with few, those with many ties show up disproportionately in sets of friends. For example, those with 40 friends show up in each of 40 individual friendship networks and thus can make 40 people feel relatively deprived, while those with only one friend show up in only one friendship network and can make only that one person feel relatively advantaged. Thus it is inevitable that individual friendship networks disproportionately include those with the most friends. For example, your co-authors are cited more often than you , and the people you follow on Twitter post more frequently than you do . In fact, any attribute that is correlated with degree will produce a paradox [13, 23]. Thus, if heavy drinkers also happen to be more popular, then people examining their friends’ drinking behavior will conclude that, on average, their friends drink more than they do. The paper makes what they call a novel observation, extending this phenomenon to what they call contagious behaviours. They describe any attribute (or behaviour) that is binary, such as "has red hair" or denies climate science (though they didn't use that last example). They explain that under some conditions, this can create what they term a "majority illusion". The paper includes a diagram to illustrate the "majority illusion". In the two diagrams below, the two networks are identical, except for which three nodes are colored. These are the “active” nodes and the rest are “inactive.” Let's say the red nodes represent people who deny climate science. In the first network below, all “inactive” nodes observe that at least half of their neighbors are “active" - or at least half their neighbours think climate science is a hoax. In other words, looking at the network above, despite the fact that only three out of 14 people in their network believed that climate science is a hoax, each person in the network would think that half the people think it's a hoax. 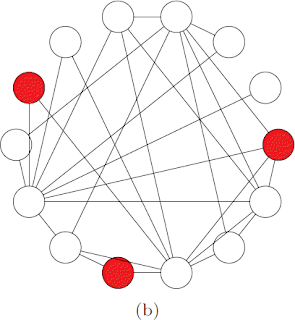 In this second network, identical to the one above except for which nodes are active, no “inactive” node sees that many "active" nodes. In other words, the most that any inactive node sees is that maybe two people think that climate science is a hoax, and lots don't even see one denier. Local prevalence of some attribute among a node’s network neighbors can be very different from its global prevalence, creating an illusion that the attribute is far more common than it actually is. In a social network, this illusion may cause people to reach wrong conclusions about how common a behavior is, leading them to accept as a norm a behavior that is globally rare. This may explain how global outbreaks can be triggered by very few initial adopters, and why people overestimate how much their friends engage in risky behaviors, such as alcohol and drug use. Linking it back to the friendship paradox, the authors write how the "'majority illusion' can ultimately be traced to the power of high degree nodes to skew the observations of many others". 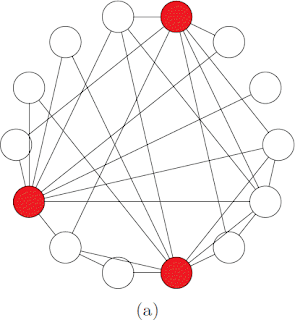 As I understand it, high degree nodes are like the people with lots of friends in the "Friendship Paradox" described above. However it depends on the networks. They write about the difference between disassortive and assortive networks. In disassortative networks, nodes prefer to link to dissimilar nodes. An example is a star composed of a central hub and nodes linked only to the hub. Political networks were cited as disassortative. In assortative networks, nodes were said to have a tendency to link to similar nodes ie high-degree nodes to other high-degree nodes. Specifically, we showed that the paradox is much stronger in disassortative networks, where high degree nodes tend to link to low degree nodes. In other words, given the same degree distribution, the high degree nodes in a disassortative network will have greater power to skew the observations of others than those in an assortative network. Given that political blogs, like WUWT, would be considered a disassortative network, you can see how the crazy ideas posted there spread easily through the deniosphere. What I take from this idea is that it's important to show the illusion for what it is. People who venture into hostile denier territory like WUWT to scatter a few seeds of reality are the real heroes. It also demonstrates the importance of papers like Cook13 - the 97% paper. The Social-Network Illusion That Tricks Your Mind - article about the paper in MIT Technology Review. My father taught me to always avoid the mob or group think without looking at the evidence. Just because a majority of the people you know have an opinion does not make it correct. One thing I noticed about Australian pub culture was that someone who drank more than you was a pisspot and someone who drank less was a wowser! I have been called both! Since he has weathered the implosion of the population bomb , the meltdown of nuclear winter, the transformation of Energy Crisis into the Oil Glut and some embarassing bets against Julian Simon,, who could be so cynical as to question Paul Ehrlich's authority ?